If you’re looking for the best BCAA blend, you might have come across Nutrex Amino Drive Black at some point. In case you’re wondering, Nutrex is also the brand responsible for the widely-popular fat burning supplement, Lipo-6. Nutrex Amino Drive Black is a specially-formulated BCAA supplement to quickly load up BCAAs with some little extras on the side. Nutrex Amino Drive Black is just the kind of supplement you’d expect from Nutrex. It contains no artificial flavors, but it comes in APPLE AMBUSH and SUCKER PUNCH flavors. Its recommended intake is 1 serving (1 scoop) in 12 or 16oz of cold water during training days, 30 minutes before or during exercise, and take any time during your off-days. BCAAs are workout target-specific, meaning that it’s not equally beneficial for everyone since we all have different workout goals. BCAAs are suited for people who are going through the cutting phase since the BCAAs in protein shakes take a while to be absorbed, and individuals who cut greatly need the immediate feed of amino acids to their muscles to prevent stagnation and muscle catabolism. Who uses Nutrex Amino Drive Black? 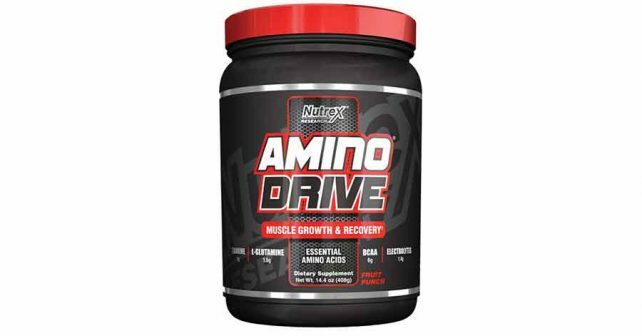 Nutrex Amino Drive Black is typically used by people who are going through a cutting phase. Nutrex Amino Drive Black goes well with Nutrex’s other popular product, Lipo-6 since the stack helps users burn fat and build muscle at the same time. The main component of Nutrex Amino Drive Black is its BCAA content L-Leucine, L-Isoleucine, and L-Valine. It contains a 2:1:1 ratio of the ingredients that yields a total of 6 grams BCAA – one gram more than other popular products like BPI Sports Best BCAA. Other BCAA brands do not carry the same ingredients, but it’s also important to note that all of these added ingredients can be easily acquired through a person’s regular diet, and no further supplementation is needed. Also, if you’re taking your daily dose of multivitamins, you are probably getting the same dose already. Probably the best thing about Nutrex Amino Drive Black is its added L-Glutamine and Taurine. It contains 1.5 grams of L-Glutamine, which should be sufficient to help increase muscle performance, and Taurine to improve stamina. Although the Glutamine content isn’t really 100% of what you need, the amount is within the range that it could contribute to muscle development. Nutrex Amino Drive Black is a solid product from Nutrex. It slightly edges other BCAA products in terms of pricing and BCAA content. However, it’s important to note that taking BCAAs will not guarantee the prevention of muscle catabolism. It’s better to take a BCAA supplement like Nutrex Amino Drive Black and stack it with the best supplements for muscle gain that improves blood flow, like NitroGenix 365. An improves blood flow also enhances the flow of nutrients to your muscles, which is what you really need to prevent muscle catabolism.